The ancient Greek colonists of Faros were not altogether firmly settled, despite their clear legacy of agriculture on the island. In fact the Stari Grad Plain was constantly under threat from the local Illyrian tribes who really didn’t want them there. 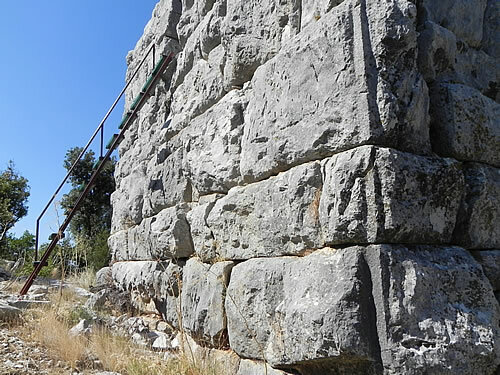 High above the town of Jelsa, the Greeks built a big strong watchtower with huge blocks of stone. 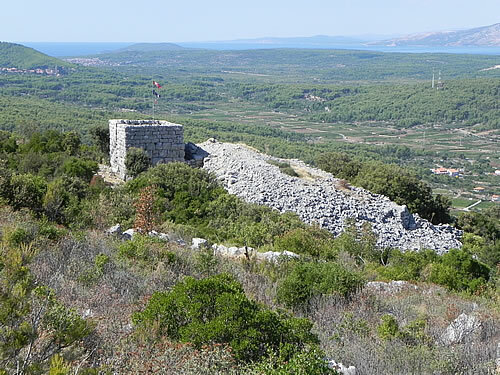 It was at the furthest extent of their influence, a half-day march from the safety of Faros ( today’s Stari Grad). From Tor, you can see for miles, it’s absolutely glorious. On the day we went up, the world was sparkling clean after a thunderstorm followed by a good brisk bura. There’s nothing like a strong northwestly to clear the air. 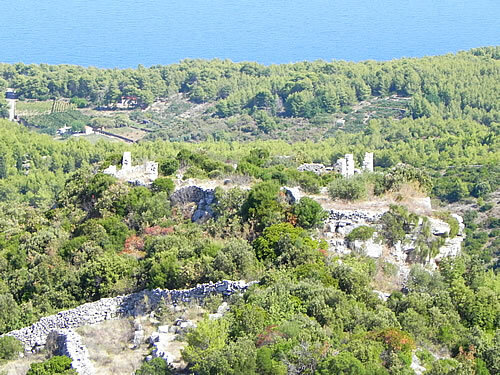 You’re 210 metres above sea level, looking straight down to the harbour at Jelsa, and the surrounding forest. 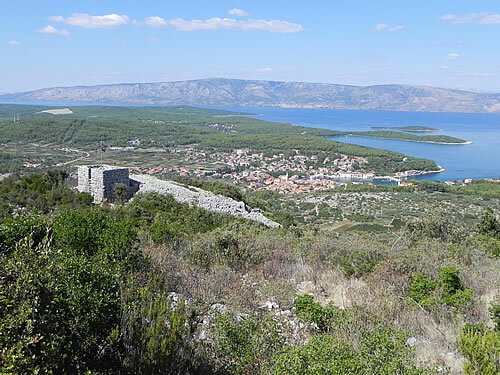 At this height, the island of Brač has detached itself from the north coast of Hvar, with Bol and the entire south coast in view. 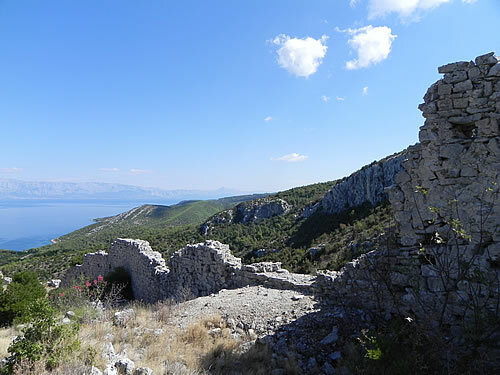 Beyond Brač, the mountains above Split are visible, and the whole curving wall of the mainland right round to Makarska, Biokovo and southwards until it meets the end of Hvar, some 50 kilometres to the east. 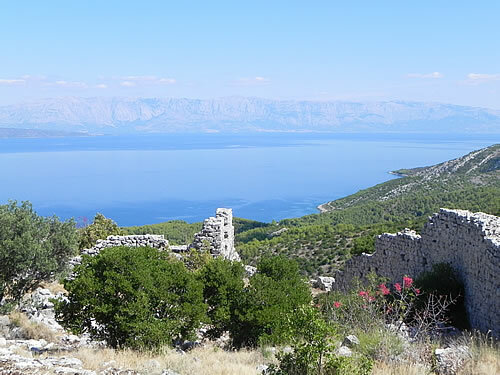 But, noticeably, what you can’t see from Tor is Stari Grad. So what good was a watchtower without clear line of sight to the parent colony? Well, that’s where Maslinovik came in. 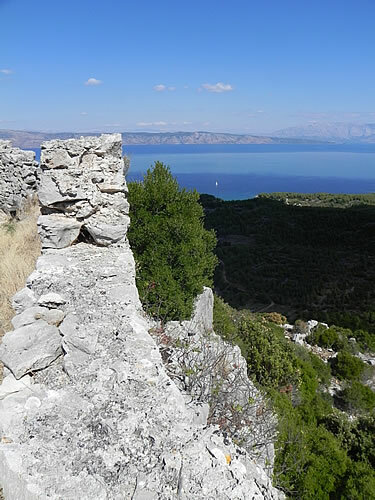 That smaller watchtower is visible from both Tor and Stari Grad, and acted as go-between when the fires were lit to warn of attack. The present tower at Tor still shows the enormous stone blocks of its Greek foundations. 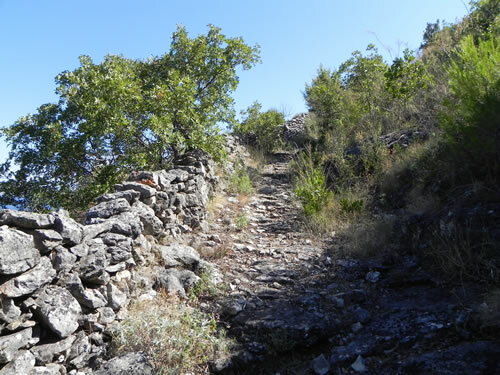 Built on the site of an earlier Illyrian hillfort, it has been restored in the 1950s after being bombed in the second world war. That would probably be the British I fear, as it was certainly them who bombed Vrboska. It seems wrong to trash such an ancient monument, but clearly this is still a strategic position from which to defend the island. There’s a ladder up into the tower itself. I guess it’s more defensible with the entry well above ground level. 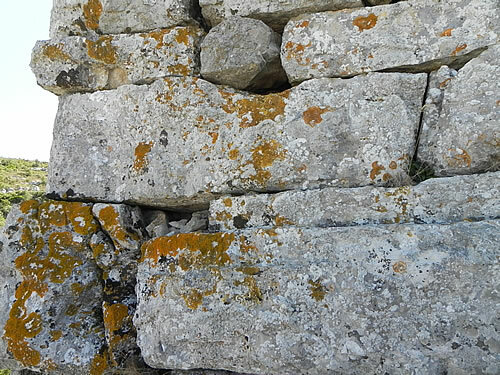 Some of the blocks are clearly original, and have not moved in several centuries. Interesting to speculate where these whopping great blocks were quarried, and if not locally, however did they get them all the way up that hill?!! The trail we used starts at Our Lady of Health, that’s the church on the road to Humac, high on the south side of Jelsa. The path leads round to the right of the church. 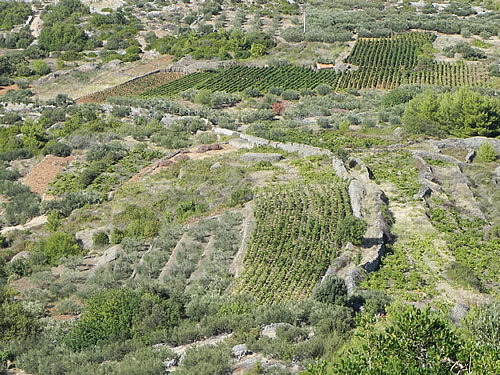 There are signs for Tor and Galešnik that wend through vineyards and olive groves, very pleasant. At some point, signs for Vrh start to appear. As that means peak, or heights, we rather thought we’d leave that for another time. As usual we’d picked a hot day and the cooling bura had dropped. Reaching the east-west track at the foot of the escarpment, we have a choice. The sign for Tor points directly uphill for what appears to be a brisk climb. A few steps further left, signs for Galešnik and Vrh are cunningly hidden in the undergrowth, indicating that you need to push your way through brambles and bushes. We chose that way, and after the initial overgrown turning, we found ourselves on a well built stone track that zig-zagged upwards. I could imagine donkeys trekking up that path in ages past, carrying supplies. We had the place totally to ourselves on a Sunday morning. At one of the right-hand bends, we could see across to Tor, though we’d found no signs to indicate we could go that way. Onwards and upwards, turn right and climb, turn left and climb again. 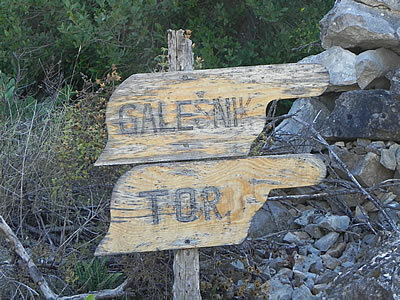 At some point we ran out of signs for Galešnik, and stopped to consider our position – ah yes, there it was below us! Completely invisible from underneath, the remains of the high walls were very clear from above. We’d missed our turning, and were well on our way to Vrh! Retreating back down the track we found the side trail leading up to the promontary that we knew by now was the site of the hillfort. Another couple joined us on the way up, having come across from Tor – so we knew there must be a path joining the two monuments! Galešnik as a hilltop settlement probably dates from late antiquity. It was strong during medieval times, when it was dangerous to live at sea-level. And I have to say this is not an easy place to find. From below, you can’t see it at all. From above, we had a view of high walls, but it’s set amongst pines, high on a rocky shoulder jutting out from the hillside. The path up takes you to nearly the right place, but the signs have pretty well deserted you by this time. 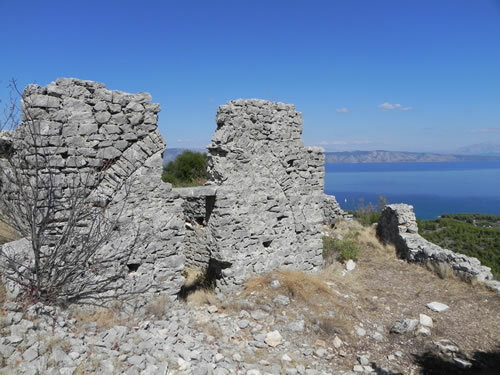 And Jelsa, unlike the more helpful Stari Grad, does not mark its ancient monuments with bright orange signs with maps and descriptions in different languages. You have to work out for yourself what’s there, and how to get to it. And there it was. Set on the promontary are old walls that blend so wonderfully with the rocky crags that you’d never know any kind of settlement was there at all. The walls are a perfect extension of the stone outcrop, echoing the ridge to its right. I really wished for more information on the people who lived here – who they were and when. But I don’t think this place has been excavated, so little is really known. One building is mostly still standing, while the others have to be largely imagined. It appears to have a barrel vault and is possibly an early church. But what a place! The view from this high eyrie is absolutely stunning, quite beautiful and worth every painful step of the way up.